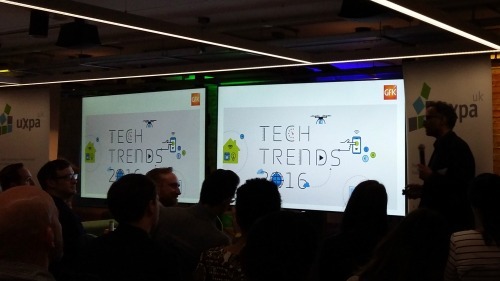 This months UXPA meeting was themed round UX Trends for 2016. 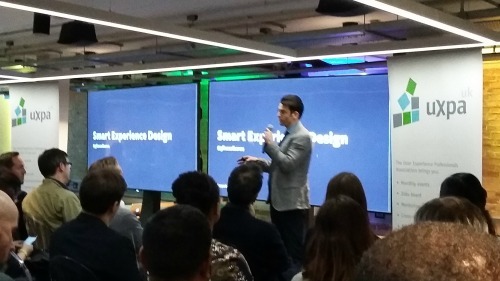 The first speaker was Giles Colborne from cxpartners talking about Smart Experience Design. He believes that AI will be the next big thing. As experiences become more personal and screens get smaller conversion rates are dropping. If smart technology was used to help users, this might remove some of the pain of small screens, making conversion rates rise again. He also talked about predicting the future by using algorithms and machine learning, which might not be perfect but could be pretty amazing if expectations are set correctly first. 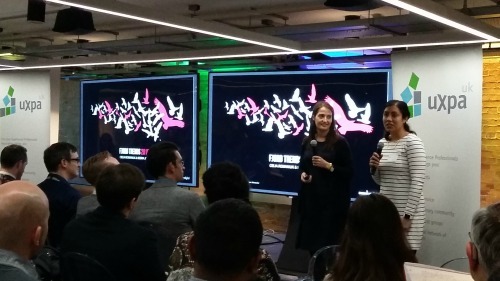 Next we had Seema Jain and Celia Romaniuk from Fjord. Their two key trends for 2016 revolved round Design From Within and Services With Manners. To start with they discussed how more and more companies are bringing design teams in-house. Part of their work is educating organisations on how to do this and their key take aways are that communication takes time but is worth it and learning should be two way. The second point was about Services With Manners. We all know there is a big issue with sharing data and trust between organisations and users. Especially when this data means that our behaviour can be predicted and more importantly controlled. So their point was that maybe what we need is services with ethics, not just manners. Lastly Ranjiv Dale from GfK spoke on how users really need communication, confidence and collaboration from brands. As examples he talked about how smart homes are something a lot of companies are now working towards. However users have high expectations about how they should work, including being easy to set up and communication between vendors. But if there is communication between different companies, who looks after the users data? The other thing he spoke about was mobile payments and how take up has been limited by several things, including the media scaring users with talk of how insecure it is, but also the existing payment mechanics, if you can already pay for things with your contactless card why would you use your phone? It was a really interesting evening and the fact the same issues kept coming up suggests these guys are on to something. I look forward to seeing what the future holds.